I recently took delivery of this new fandangled product called the Cobra Tire Tool. Now that you get the idea on how its supposed to work, I decided to test it out on my Soma Double Cross. 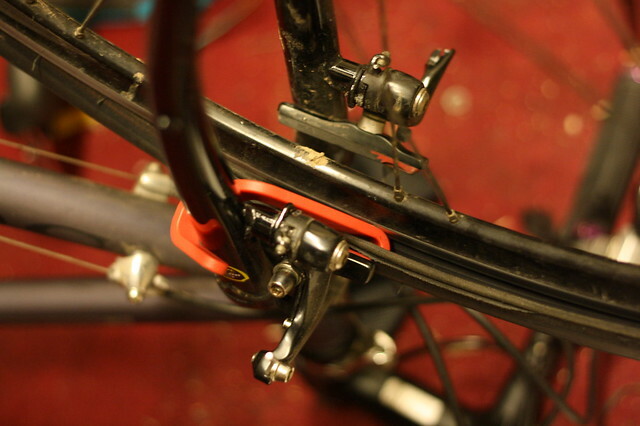 The video shows it being used on side pull brakes, but my CX bike has canti-lever brakes. Here’s a photo of the tire brand/model that I used. I flipped the bike upside down and went to work. I had to undo my brakes to gain extra clearance. It even worked on the rear triangle of the bike. I was genuinely impressed on how well the Cobra Tire Tool worked! Basically it uses the wheel as leverage to get the tire off quickly. 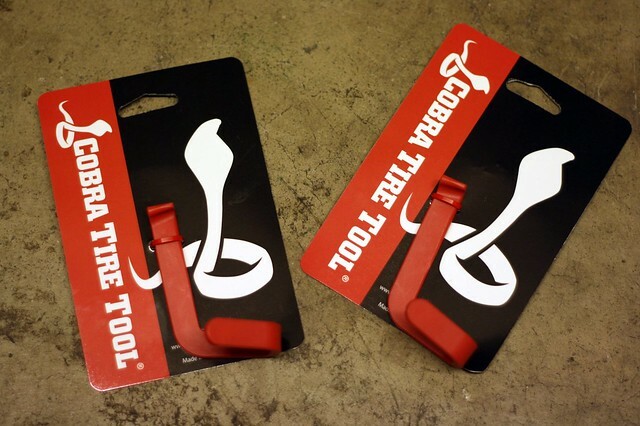 So why would anyone need the Cobra Tire Tool over a traditional tire lever set? For one its far more convenient. You only need one Cobra Tire Tool than the 2-3 standard levers. 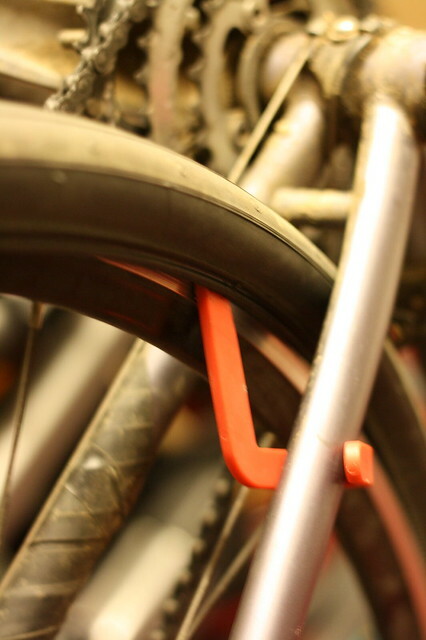 Secondly, I also believe its quicker to use the Cobra Tire Tool over standard levers. Overall I think they’ve taken a great idea (the standard tire lever) and made it better. Kudos to Cobra Tire Tool for doing so! Elizabeth, hang in there. I have a tool in the works that is designed specifically for the hard to mount tires. Also, the Cobra Tire Tool can be used to remount the tire by hooking the tool under the tire and onto the rim. From this point you gently lever the tire up and over the rim. If you are at home, you can use a non-petroleum lubricant like soap, to lubricate the bead of the tire. This will greatly reduce the friction on the surface and allow for a bit less effort. I am a little amazed…I thought we’d reached the zenith of tire lever design, but this device is actually pretty cool! Seems to work easily, too. I am holding out for the remounting lever — as Campagnolo wheel owners can attest, mounting some new tires onto the rims is a Herculean effort. While I find the design intriguing I feel the Cobra is a solution looking for a problem. If I had to go further, I’d say that I was unimpressed with the fact that there needs to be 2 separate versions (Road & MTB)and the fact that the directions repeatedly call for some form of lubrication. (A request repeated in Cobra’s first post) Seriously how many of us bring dish soap on our commutes? I can honestly see someone trying to force this thing and causing further damage to the tire. I’ll be sticking to a Quik-Stik or even some good ol’ Park levers. Wow Raiyn, This is the exact same post you had on Bikehacks! While I may not have the experience that you have on a bike, I did retire as an engineer from the tire and rubber industry. This tool has taken into account many different aspects and has produced a unique alternative to working on bike tires. As for the use of lubrication, That is just a given! Anyone who works with tires that are hard to mount should always use a lube. Granted, if not at home it may not be possible. However, when you can, use it! Lube always reduces surface friction which is beneficial in so many ways. i.e. less effort, and less likely to tear your tire bead. 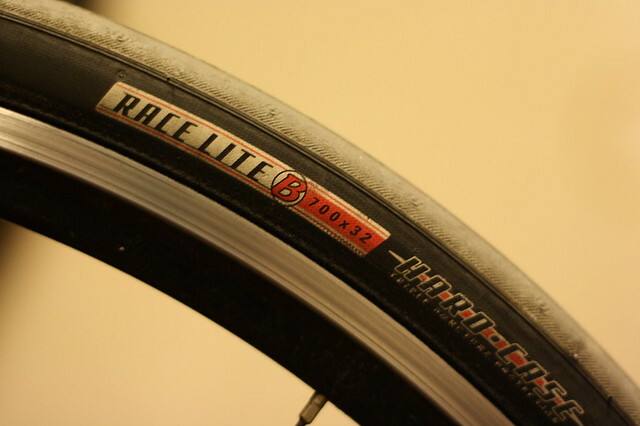 Once you tear the rubberized surface on your tire bead, you expose the underlying materials. this causes the tire to perhaps not fit securely on the rim (rim slip) or even damage the bead material to the point that it will not safely remain mounted to the rim. As for me, I am a woman who doesn’t want to wrestle with my tires. Anything that makes it easier is a plus. You young guys just keep on doing it your way if you choose. I tend to take the smarter approach. Raiyn or should we call him “negative Nancy” likes to come on here and beat his chest. I don’t think I’ve ever read anything posistive that he’s posted. At least I’m not the one with a messiah complex. As for being negative: I’ve posted plenty of positive material and reviews, (most recently backing and posting supporting comments for Fiks:Reflective Rim Stripes) but I will not varnish my opinions to suit a false prophet. While I appreciate your experience in the tire and rubber field I disagree with several of your points. I can change almost every tire in my current stable easily with a single Park lever. The one difficult set (mentioned in my earlier post) requires a Quik Stik. My better half can do the same, so gender has no role here. The last time I tore a bead or sidewall was about 25 years ago when I was using a screwdriver to dismount the tire. As for lube, the only lube I’ve ever really needed has been from the talc I use between tire and tube when I (re)install a set. I think the Cobra is an interesting design and I’m sure there’s a market for it, I just don’t see it as the ultimate tire tool that people seem to want it to be. I viewed the Cobra Tire Tool at the 2010 Hilly Hundred and almost purchased one. I then ordered one and used it. It worked just like the video. Some people can dismount and mount tires with bare hands. Others, including myself and most woman, cannot use hands and need tools. 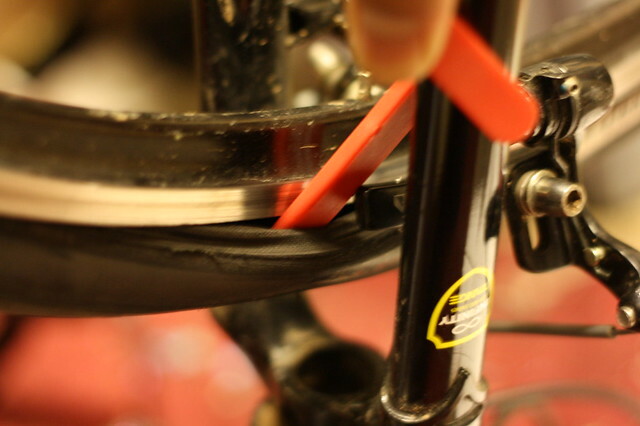 Strength is taken out of the equation, only one tool is required, and it is an almost foolproof method for mounting tubed tires and not punch a hole in the tube. It is an ingenious design and if I was teaching a class on bicycle tire mounting and dismounting for Women, it would absolutely be part of the presentation. It’s amazing how often the supposed point “it’s so easy a girl can do it” (or words to that effect) comes into play in the marketing of this product and the comments of it’s supporters. Honestly I find such comments rather offensive in their connotation. Especially given that Team Estrogen has posted instructions on how to change a tire without levers. Now Dwight, I’m surprised a larger, experienced roadie like yourself lacks sufficient hand strength to operate a conventional tire lever when my better half who has received treatment for carpal tunnel syndrome can do it fairly easily. I also find it somewhat interesting and commendable that so many Hoosiers are backing this product. I have never seen so much bad ink spilled over a $6 tool. By the gods man, get a venti coffee or whatever your preferred utility for $6 is. In the meantime I’ll try to find it and throw it up on my pegboard, next to my $20 chain checker.